This latest sewing adventure of mine is in my top 3 of favorite DIY projects I have done. 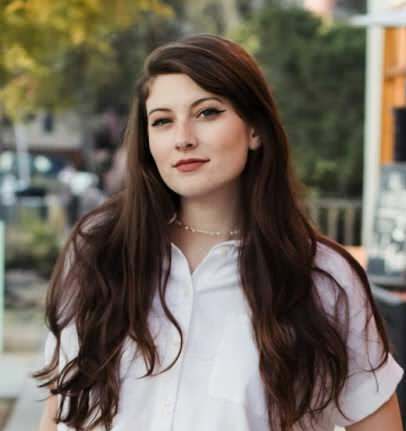 It's an easy sewing project and based on the fabric that you select, you can have a really beautiful skirt for a faction of the price that you would spend in store. There is a lot of text in this post, but do not let it scare you! I promise that if you take the time to read this, you will easily have a skirt in no time. Also, please read the whole tutorial before making the skirt...measure twice, cut once, right? Please adjust the amount of fabric based off of length of your skirt as well as your size. You will want these fabrics to stretch, so you will need 2-way stretch fabrics. Check your fabrics and if you are ordering online, if you want to be extra sure order a sample or contact customer service. The fabric needs to be able to stretch over the hips. I also recommend that you make this skirt of muslin (test fabric) or out of the lining before cutting your fancy fabric, to ensure you have the pattern fitting correctly. The first pattern piece that you will be drafting is for the top part of the skirt. You can take a stretch pencil skirt and trace it, just make sure that the fabric of the pencil skirt is close to the fabric you have bought in terms of stretch. If you don't have a pencil skirt, no worries! Essentially, you need to draw a rectangle. Your length should be however long you want the top part of the skirt to be, from the top of the waist to the bottom of your knees if you are making it like mine. Then make outward curves near the top to account for hips, if you are like me! We want the skirt to be more narrow around the knee area, so taper it in a little bit. Remember to cut your fabric a little smaller than your normal size so that it is tight on you, but not too tight that you can't stretch it over your hips. Don't forget to add seam allowance, as well as adding some extra inches at the top so you can fold over the top of the fabric to insert an elastic waist band. 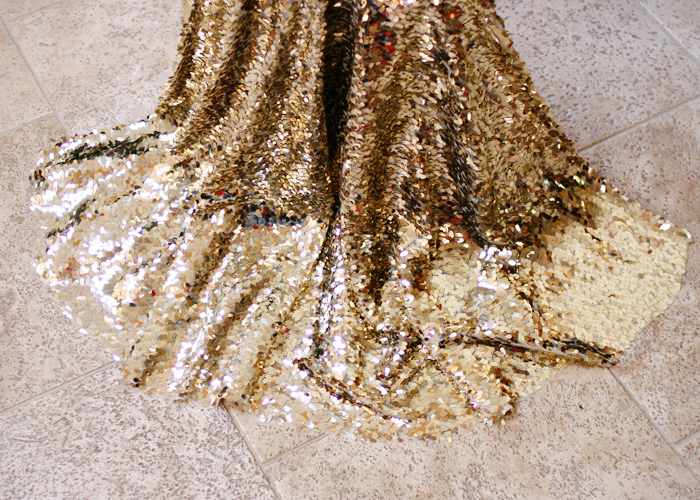 You will want to cut two pieces of the lining, and two pieces of the sequined fabric. Stitch your side seams with right sides of fabric facing together. 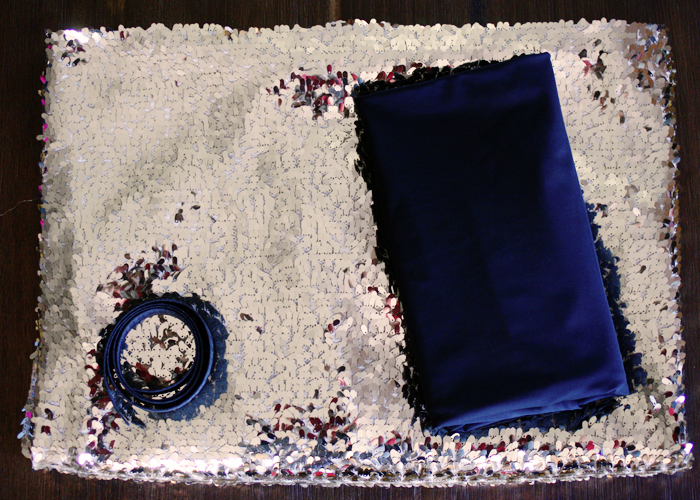 For now, keep the lining skirt and the sequin skirt separate and set them aside. Now you will draft a pattern for the bottom part of the skirt. Super easy!! There is some math involved but there are so many blogs that explain clearly how to do this. Refer to this blog for how to draft a circle skirt. 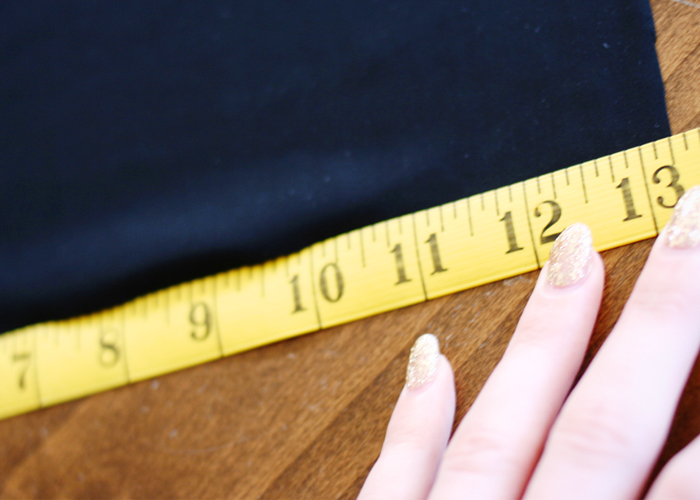 One note, when you need a "waist" measurement, measure the bottom of your skirt that you made earlier and that will act as your "waist" measurement for the circle skirt. 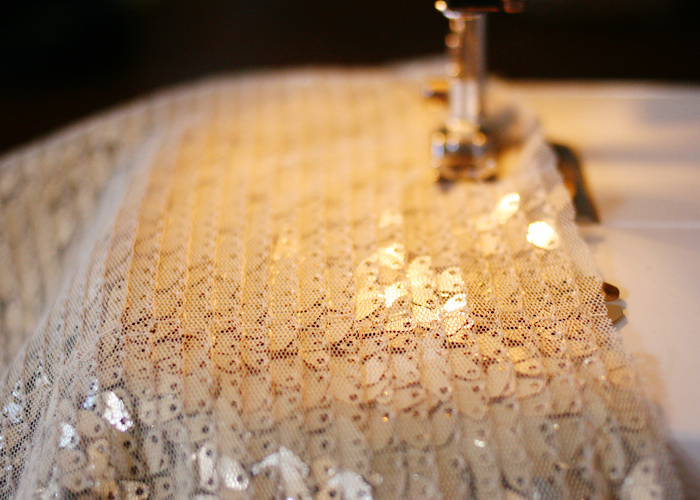 I made this part in my lining and in my sequined fabric. 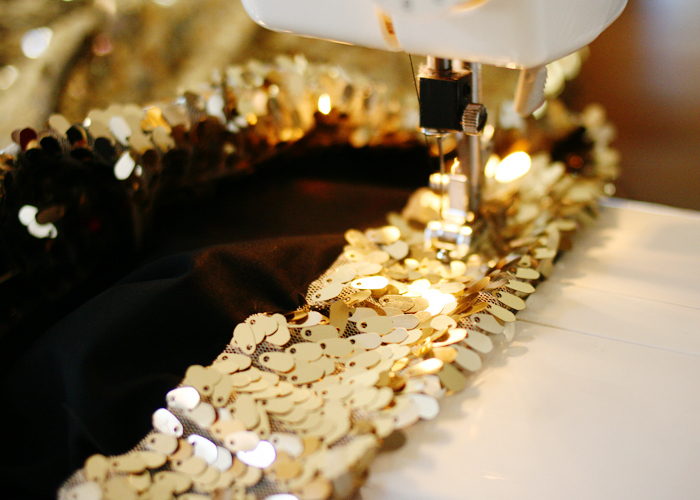 Sew the lining circle skirt to the bottom of the pencil lining skirt, as well as the sequin circle skirt to the sequin pencil skirt. You will essentially have two skirts at this point, one of lining and one of your beautiful fabric! Almost done! 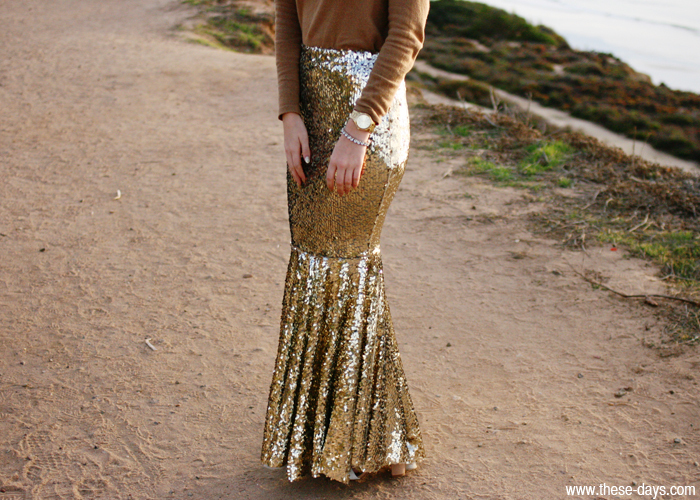 Turn your skirt made of lining inside out and drop it down into the sequin skirt. This way you have wrong sides facing, and there will be no seams showing when you look inside the skirt. Line the waist bands up together and pin. 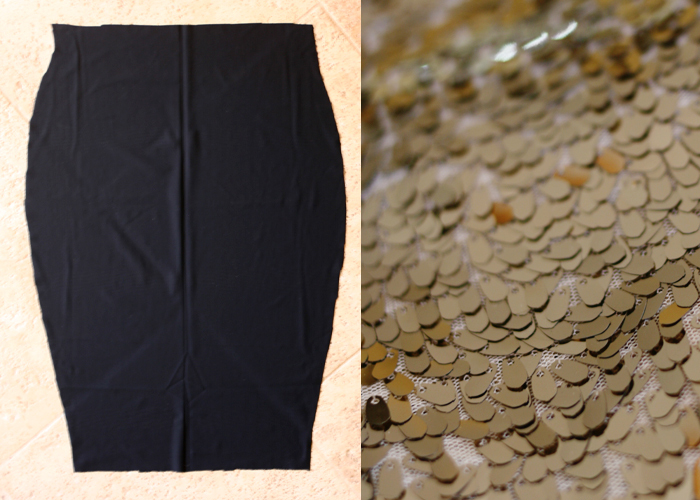 Now fold the top of the skirt inside, making sure that it is wide enough for you to put your elastic in. Sew all the way around leaving a three inch opening. Put a big pin through the end of the elastic. 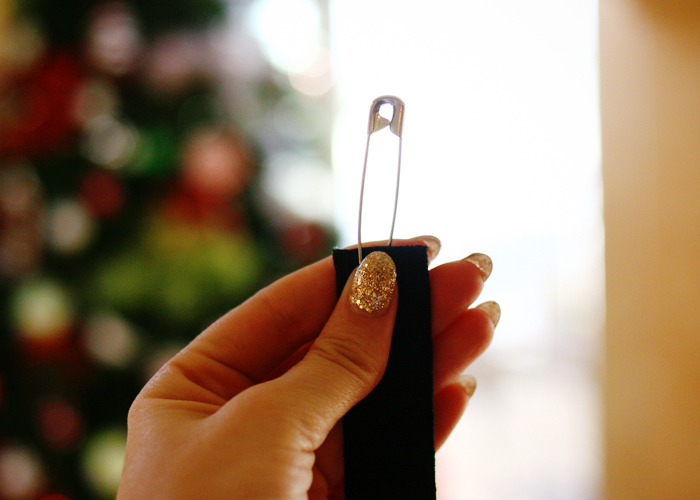 This will help you slip it into the opening band that you just sewed, and slide elastic in! Sew the ends of the elastic together and stitch the three inch opening shut and there you have your skirt! Now go shimmy in the sunshine anywhere you can find it, and twirl to your hearts desire! This is gorgeous! And you made it so simple. That skirt is intense, how creative! Wow. I'm really impressed. This skirt looks amazing! How much did it end up costing you overall? you can do it!!! just practice!! Absolutely gorgeous!!! I want to make one!